Urbana’s Market at the Square is taking over FMC’s Instagram through next Monday. 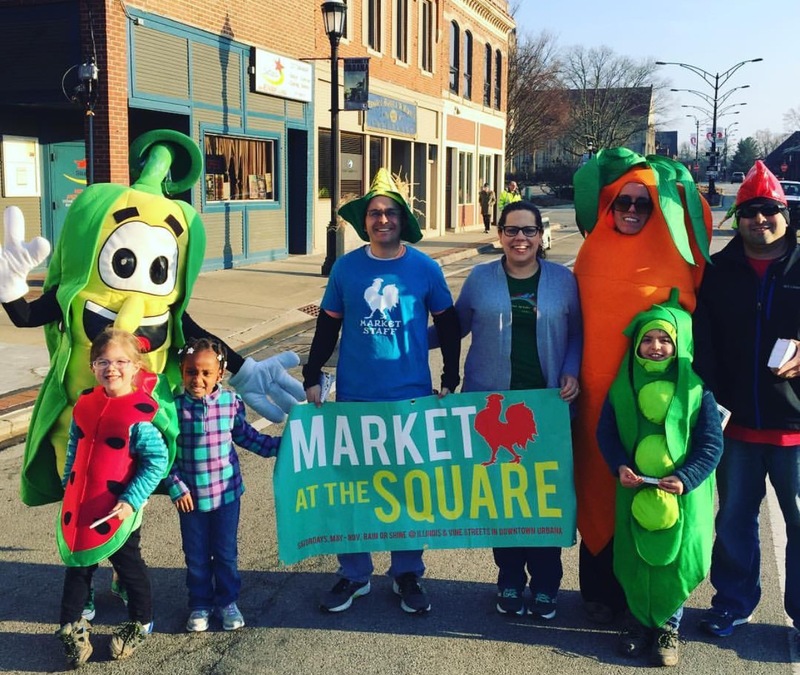 This 37 season strong market is jam packed with programs that provide customers with local food access, cooking education, and a healthy dose of fun. Those that know it best, such as Sterling Bollman, Urbana’s Assistant Director, know that the market is genuinely invested in bettering customers’ quality of life. Follow along with Urbana as they snap and post away! Sterling Bollman: Urbana’s Market at the Square has been a staple of the Champaign-Urbana community since 1979. This upcoming season will be the 37th year this Market has been in business. For the Market, we have a Market Director (Natalie Kenny Marquez) a Market Assistant Director (Sterling Bollman) and then we hire 8 other seasonal staff members to be either Market Laborers (help with set-up and tear down) or Market Staff (help run the daily operations every Market date). We typically average around 200 vendors for a season, with 80-100 of those attending the Market on Saturdays. While we do not have a particular interesting product or story, our Market is a producer-only market. This means that, in order to sell his or her product, the vendor must be involved during the entire process of making what he or she is selling. This makes our market unique and also gives the customers a peak into the life of the vendors, creating new relationships. SB: From the first Saturday of May to the first Saturday of November, our Market takes place outside of the Lincoln Square Mall in the parking lot. It occurs in an urban area and is the perfect place to spend an hour or two on a sunny, summer day or a cool, fall day. Being an outdoor event allows for a very relaxed vibe, filled with the sounds of instruments, laughter and conversation. SB: Every Saturday, we have different programming available for those that attend the Market. On the first Saturday, we have cooking demonstrations that feature local chefs, sometimes even vendors at the Market. These chefs source ingredients from the Market and whip up delicious recipes for people to try. We also have two, local vineyards come and sample out wines that pair with the recipe. This has been incredibly successful. We then have Sprouts at the Market, our programming for children. For this program, we have staff members come teach the children about food and its uses, where it comes from, what season it grows during, etc. It allows us to create a fun learning environment for the children, while their parents are free to do their shopping and visiting. We also have Art at the Market. This program allows us to showcase local artists to the community. We always have 1 visual artist and one musical artist. It’s a great way for them to promote themselves. Finally, we have Read at the Market. Our local library comes to the Market and signs people up for library cards, allows for books to be checked out and gives balloons to all the children. SB: While we use some radio ads and website ads, a large amount of our promotions is through our Facebook, Twitter and Instagram. Nothing is better than free advertising and our following on all of our social media is amazing. My advice to those struggling with communication strategy is to utilize social media. Nothing gets the word spread quite like a popular post on social media, especially with the option of boosting posts for cheap. Being able to target your audience and have it show up on their page for weeks at a time really increases your exposure. In addition to that, we also do a Farm, Fresh and Fast program. Each week, we have a different recipe that highlights different products that are available at our Market throughout the season. We then go on our local television network every Thursday and cook it on television. Then we have the cards available on our website and every Saturday at the Market. This has helped us promote the Market immensely. SB: There are certain challenges that we have to face that are sometimes out of our control. Because we are an outdoor market, we are largely weather dependent and, because we are open rain or shine, our customer turnout can be largely effected by rain or cold weather. Another issue that has become challenging in the recent years is the constant availability of products, especially for the growers. With more grocery stores turning their focus on fresh and local food and a Coop and a Harvest Market open in the close vicinity of the Market, customers can get the food they want at their convenience and not just on Saturday mornings. This has caused a bit of a dip in attendance levels but there are ways of fixing that. Our addition of the cooking demonstrations seemed to revive people’s interest in coming out to the Market on Saturdays and has helped keep our Market successful. By doing that and constantly being on the lookout for new vendors offering new and exciting things, we are able to keep people coming. One of our biggest successes this previous season was the popularity of the SNAP benefits program. We sold over $20,000 worth of SNAP tokens, which smashed any record that was previously held by the Market. Seeing the people’s smiles as we told them of our Double Value and hearing them say things like “We wouldn’t be able to come here if it wasn’t for this program” makes it all worth it for us.